Illinois guard Ayo Dosunmu (11) looks to pass the ball during the game against Michigan State at State Farm Center on Tuesday, Feb. 5, 2019. The Illini won 79-74. 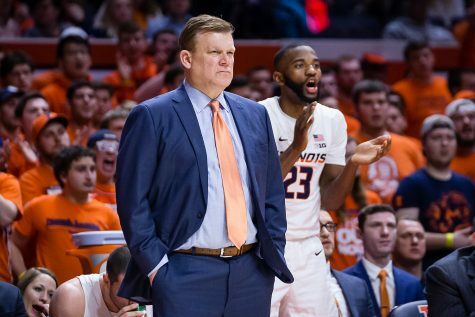 Unquestionably, Illinois got the biggest win of the head coach Brad Underwood era on Tuesday night. 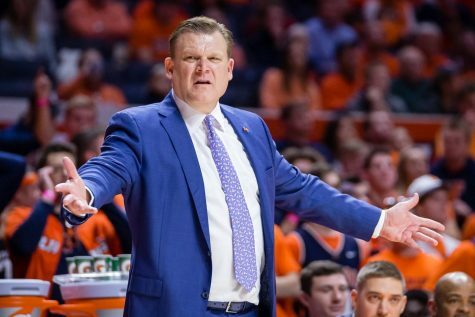 Illinois stunned No. 9 Michigan State for the program’s first top-10 win since Tyler Griffey’s buzzer-beating layup undid No. 1 Indiana in 2013. 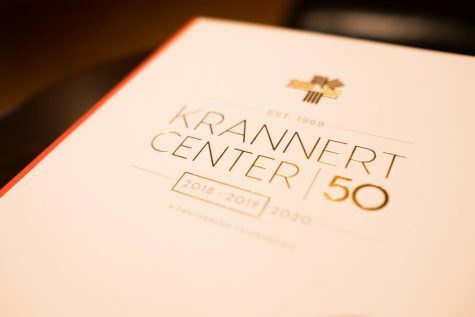 For a team who entered the night with only seven wins on the year and as a double-digit underdog at home for only the second time in 20 years, the results were special. 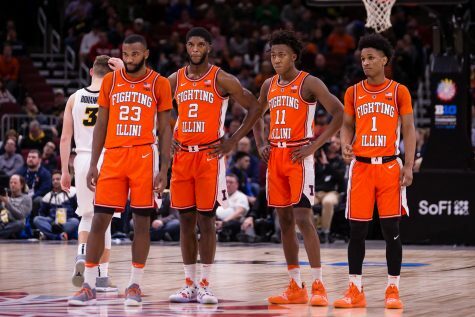 The win’s significance wasn’t lost on sophomore guard Trent Frazier either, who was one of the only bright spots in a disappointing 14-18 (4-18 Big Ten) campaign in both his and Underwood’s first year at Illinois. 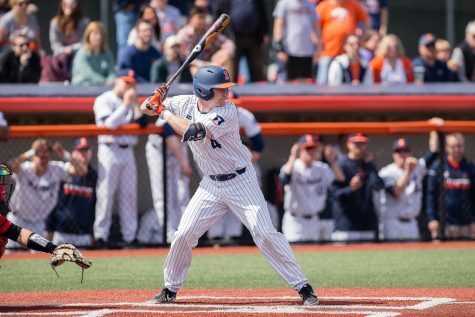 Though the Illini are just 8-15 on the year, the win was their fourth in Big Ten play (4-8, 10th place), which matches their total from last year, with eight games remaining. 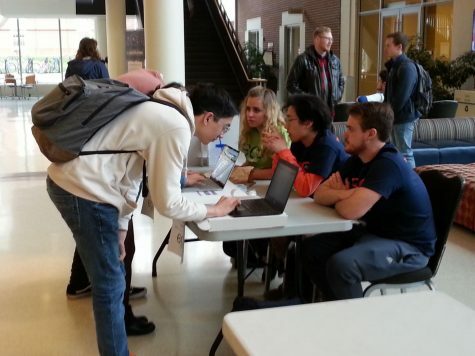 Before Illinois beat then-No. 13 Maryland at Madison Square Garden in January, the program had a 15-game losing streak against ranked opponents. 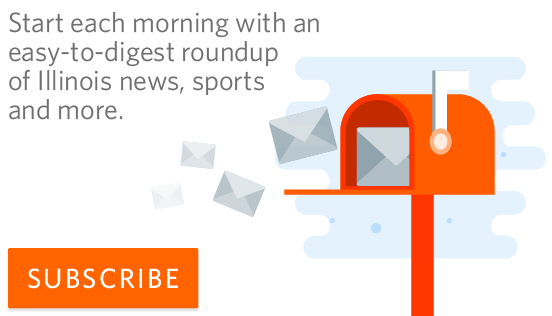 Now, the Illini have beaten two in a row for the first time since the program followed up its stunner over No. 1 Indiana with a win over No. 18 Minnesota in 2013. 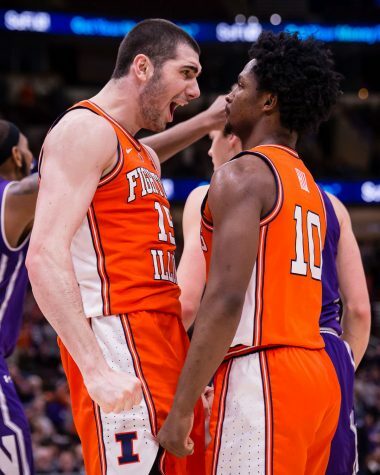 Freshman forward Giorgi Bezhanishvili embraced his brother, Davit, who is in town from Vienna, Austria, while draping the Georgian flag — the brothers’ native country — over him during the on-court postgame frenzy. For Underwood, the win coming against a Michigan State program, a team who has developed long-term success in the Big Ten, made it feel that much more significant. 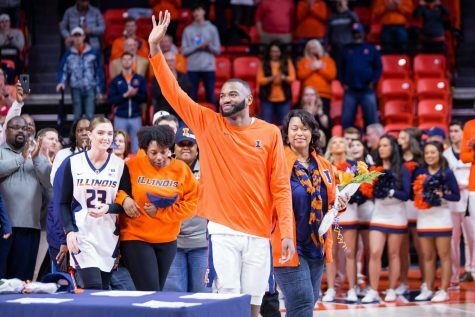 The victory sparked a long-awaited eruption from those in attendance at the State Farm Center and the Orange Krush student section eagerly swarmed the floor as the buzzer sounded off the biggest win for Illinois in six years. While Underwood held off on truly commenting on whether or not this game will be a turning point for the program, the second-year coach sure hopes it can become that. 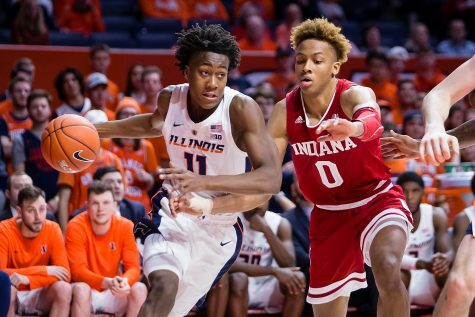 Freshman Ayo Dosunmu had his most clutch performance of his young career Tuesday night, exploding for 24 points on an 8-of-14 (4-of-8 3FG) shooting performance. 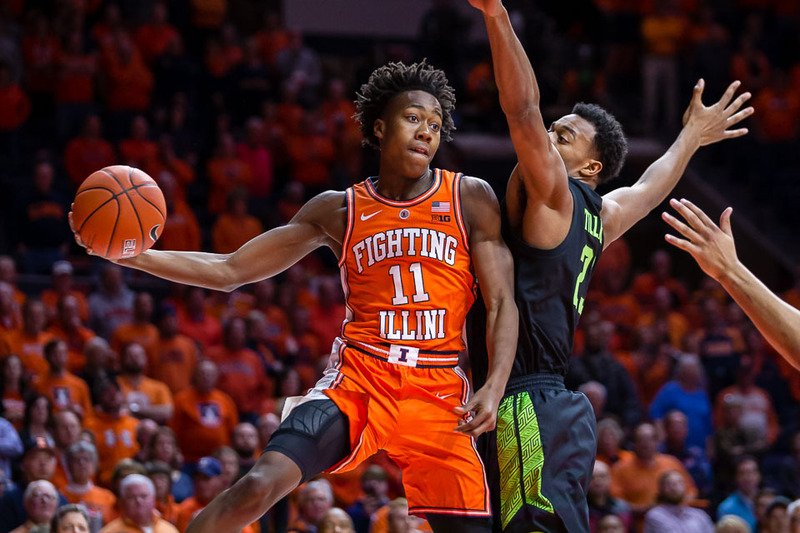 After having the vision and precision to find a cutting Andres Feliz near the rack, who laid it in to tie the game at 68 with 4:15 to go, Dosunmu made the biggest shot in quite some time for the Illini. Senior guard Aaron Jordan flew out to block a Kyle Ahrens 3-pointer on the right baseline, then Bezhanishvili collected the rebound. Frazier found Dosunmu outside the arc, who then drained a 3-pointer to give the Illini a 71-68 lead with 2:32 remaining. 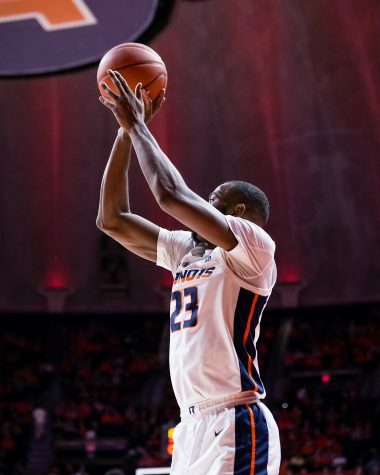 On the very next possession, Dosunmu stole the ball from Ahrens and launched a second fateful three from the perimeter, converting to put the Illini in control, now up 74-68 with just 1:54 remaining. Dosunmu commented during the postgame he was completely aware of the stakes when he pulled up. When he made the shot, Michigan State head coach Tom Izzo called a timeout, the State Farm Center burst into mayhem and his teammates swarmed him. 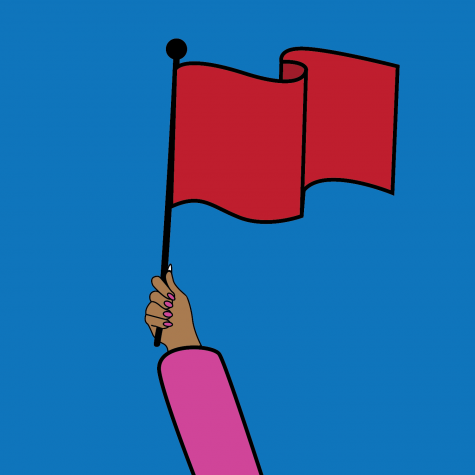 Dosunmu told them all to back off and calm down. Afterward, Underwood noted the reaction from his freshman guard as a sign of maturity. When the Orange Krush invaded Lou Henson Court after time expired, Dosunmu was swarmed, engulfed in gleeful orange-clad students. On one of the youngest teams in the country, it was almost certain an underclassman would be taking the shot in the game’s most clutch moments. Underwood had all the confidence in the team’s five-star freshman to carry the program past Michigan State and possibly over a hump. 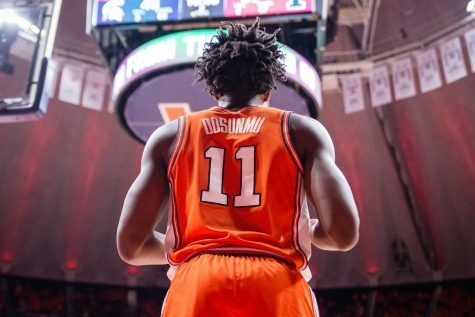 Scoring in double-digits in nine of his last 11 games, Dosunmu has earned that trust from his coach. The Spartans turned the ball over 24 times on Tuesday night. 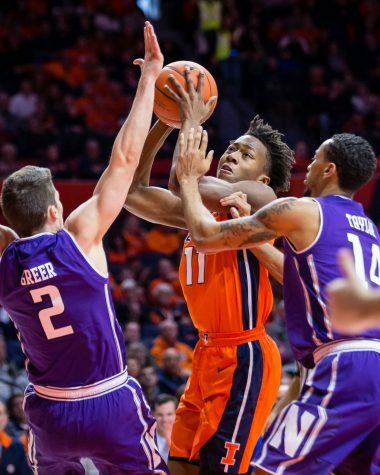 The Illini capitalized, scoring 28 points off turnovers while turning over Big Ten Player of the Year candidate Cassius Winston nine times. The Spartans tied their season high for turnovers from a Nov. 23 win over Texas. Coming into the contest, Dosunmu, Frazier and Feliz knew they had a difficult ask in limiting Winston’s effectiveness. 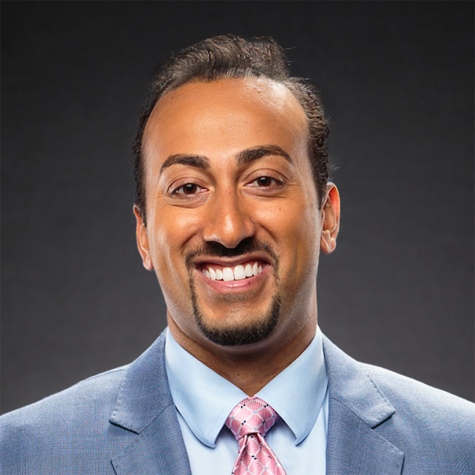 Collectively, they held the explosive guard to 21 points on 6-of-13 (1-of-5 3FG) shooting, forcing nine turnovers, though he still got nine assists. Though that’s still significant production, it was enough to muck up Michigan State’s offensive flow, especially in the first half, when Illinois forced 17 turnovers — and seven on Winston. Dosunmu and his fellow guards had put a lot of emphasis on Winston in their game prep, and it paid off in the final result. After Dosunmu hit his late threes and each team traded some free throws, Winston and the Spartans had a wasteful possession with less than a minute to go, struggling to get a quality shot. Eventually, Winston launched a three and missed and though Xavier Tillman got the rebound and was fouled, the possession took 21 seconds the Spartans needed to conserve off the clock, leaving only 25 left, down four points (after Tillman went made one of the free throws). For Frazier, the play was representative of the whole night and his team’s focus on limiting Winston. 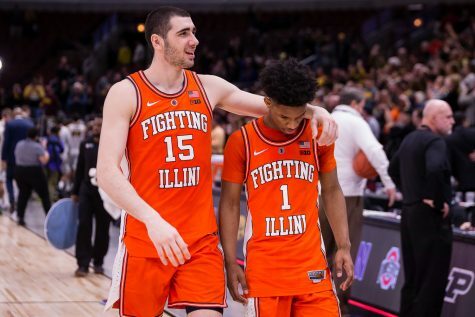 Then, he made two free throws of his own, putting the game on ice to give the Illini a victory which will be remembered for years to come.